All are welcome! Pay as you can. Both Messy Church at 9 am and the 11 am “Celebrating our Seniors” service and luncheon are cancelled tomorrow due to the ice storm. Please stay warm and safe at home. There will be music, comedy, demonstrations of skills, and so much more!!! Friday, February 9, 6:00 – 7:30 pm in the Fellowship Hall. All are welcome to a supper of scalloped potatoes and ham. 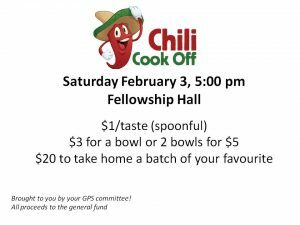 Saturday, February 3 – CHILI COOK OFF! 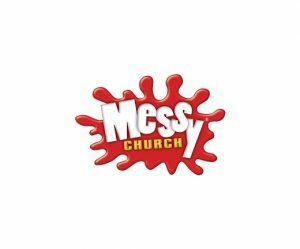 Join us in the Fellowship Hall for Breakfast at 9:00 am and then prepare to be MESSY! Stories, crafts, games, songs and more. Fun for the whole family. Join us this Sunday as we celebrate our unity as sisters and brothers in Christ. We welcome Rev. Hans Borch from St. James’ Lutheran Church to Trinity and Rev. Sue will be preaching at St. James’. The ecumenical spirit is alive and well in Elmira! What goes perfectly with football? CHILI! Calling all the amazing Trinity cooks! Is your chili recipe loved by all? Is yours the best? Here’s your chance to prove it! Join us Saturday Feb 3 at 5pm for our chili cook off. Make 2 batches of your famous chili, 1 for us to sample and enjoy on Saturday(bring it in a crockpot if you are able), and 1 for someone to purchase and bring home to enjoy the following day on super bowl Sunday. Brought to you by your GPS committee! Written with support of the Leadership team and the rest of the congregation.